Another much anticipated trip to Penton Hook yesterday and similar tactics to last time, ledgered sprat or sardine... They seemed to prefer sea fish. About an hour later another positive run on a sprat, a great fight and an old friend, the seventeen pounder I caught two weeks ago (although I didn't know it until I compared the photos). A cracking start, especially as we'd all put a fiver in for a sweep on the biggest fish! With a fish banked Dan started on the sausage sandwiches, the cooker thing had run out of gas so he used a blow torch... Which was pretty cool! An hour or so later I had the classic ledger run, this time on sardine. Click... Click click... Click click click... Zzzzzzzzzzzzz.... Cue Jaws music! 7lb 12oz, not much of a fight in the water but a spirited battle on the unhooking mat! 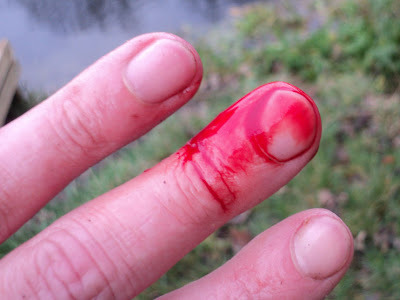 Dan was keen to unhook the first pike he caught, so I showed him how to open their mouths and extract the hook without harming the pike or getting bitten... And with that the pike got me! Not a good demonstration! Darren and I decided to sit it out and wait for a run but Dan decided to go in search of his first pike and it wasn't long before I heard a shout. 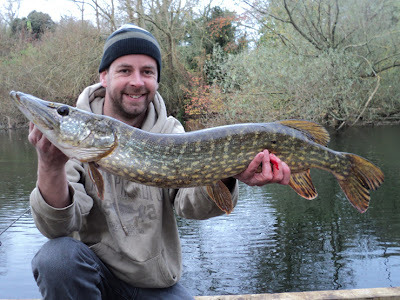 His first run and his first pike was on, I got there with the net to see an ecstatic Dan and a pike waiting to be netted. Dan's first pike, 6lb 11oz, sprat deadbait. 6lb 11oz, mission accomplished! I opened her mouth and Dan did the unhooking duties. Although he wasn't keen on holding her jaw for the photo. 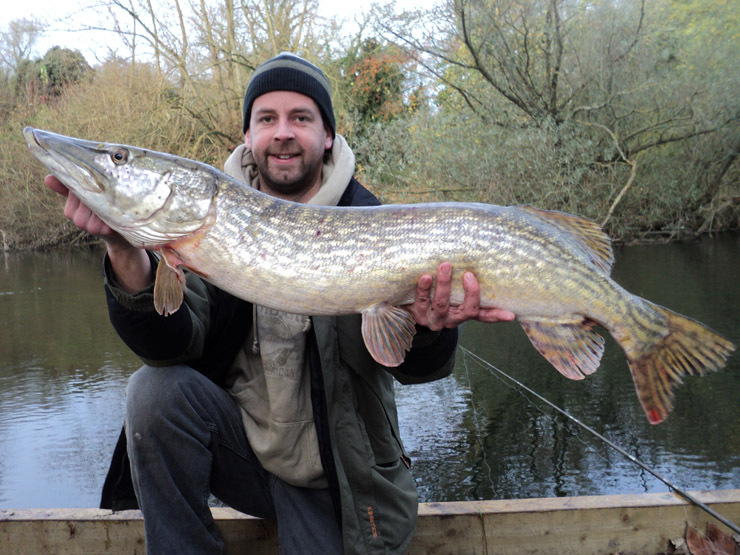 I interrupted cooking with another run on sardine, another great fight (I love river pike) and a 10lb 7oz pike. Darren filmed most of the proceedings, I'll put the video on here when he sends it to me. A second double! 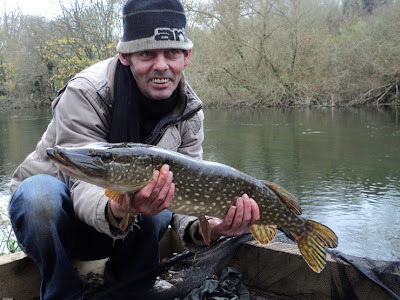 Darren had a feeder rod and a pike rod out. 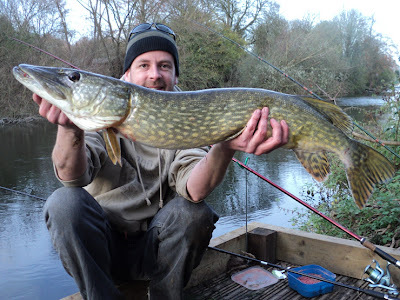 A bite on his feeder rod and a good fish on, when it was about half way cross the river I spotted it - a pike, looked like a double. But it bit through his line... Bad luck, if only it had been on his pike rod. Another run on my ledgered sardine and a 10lb 15oz pike, my third double of the day! Continuing my lucky streak, every dog has his day! sweet! looks like a great outing! hope your boo boo gets better, haha. great post. wow, what a great trip. 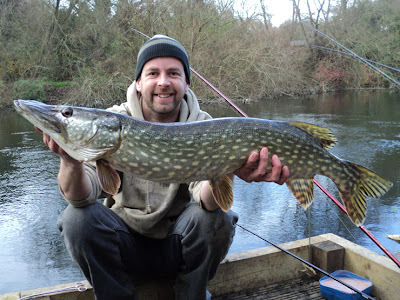 A big well done to Dan on his first Pike. You def seem to have a handle on Penton Hook know, re-captures as well! Cheers guys. I'll pass on the comments to Dan. I've heard a few good stories about the Wye recently! Looking forward to it. 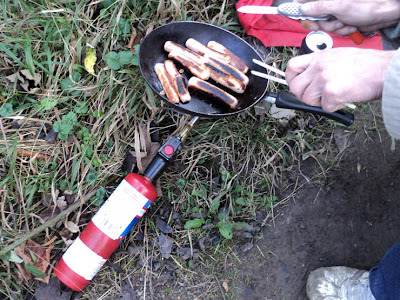 And yeah, the sausage sandwiches rocked! Nice fish guys! 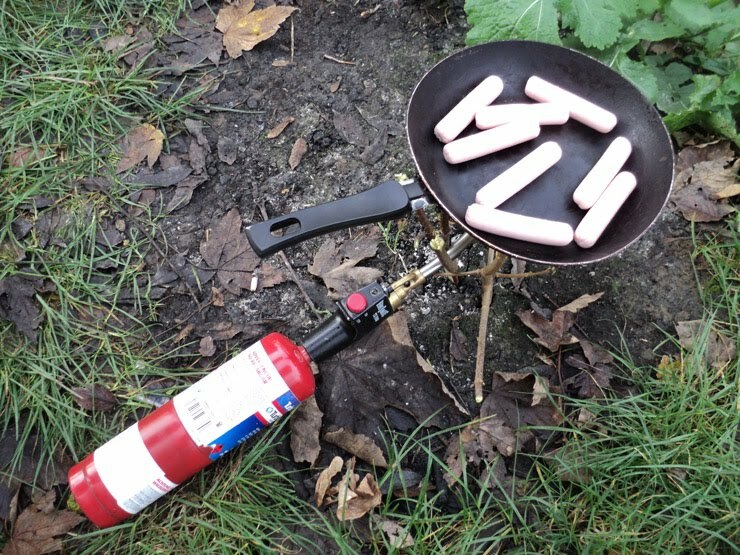 The hot lunch looks good too. Fish on!